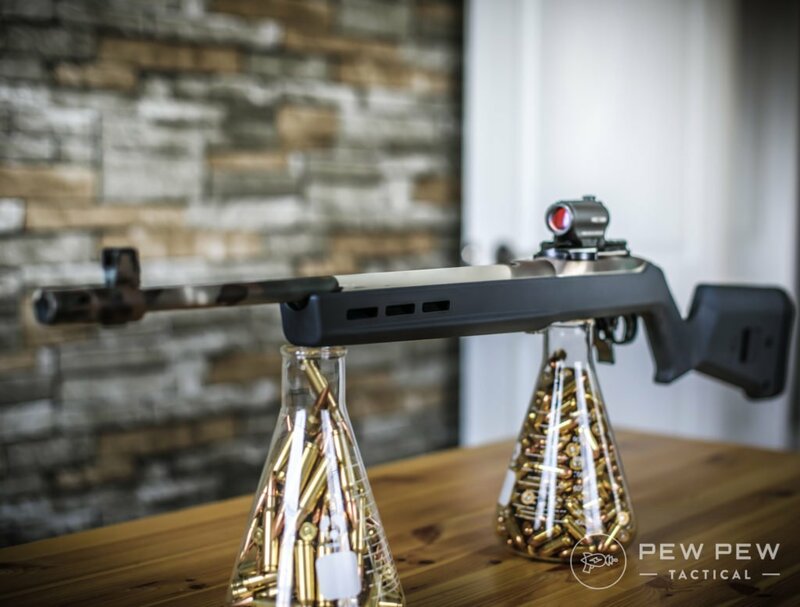 We’ve talked a lot about the Ruger 10/22 here at Pew Pew Tactical. It’s one of the most popular rifles currently available and has an extensive market for third-party parts and accessories to upgrade your rifle. So extensive, in fact, that you can build a 10/22 exclusively from aftermarket parts. But today I’m going to talk about one particular accessory for your Ruger 10/22 rifle, the scope. Good optics are essential for precision shooting, especially at long ranges, particularly if you’re hunting or precision target shooting. Some models (see our Best 10/22 Models), including the OG standard model Ruger 10/22 Carbine as well as the ever-popular Ruger 10/22 Takedown, come with a gold bead front sight and adjustable rear sight, which are okay if you don’t need to shoot very far with high precision. Other models, like the 10/22 Tactical, the 10/22 Compact, and the 10/22 Competition, come with no sights at all, so you’ll need to get a scope or sight to use with them. 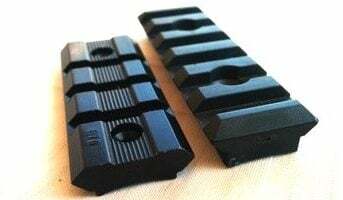 All but the Ruger 10/22 Competition come with a combination scope base adapter that works with both Weaver-style and .22 tip-off scope mounts. 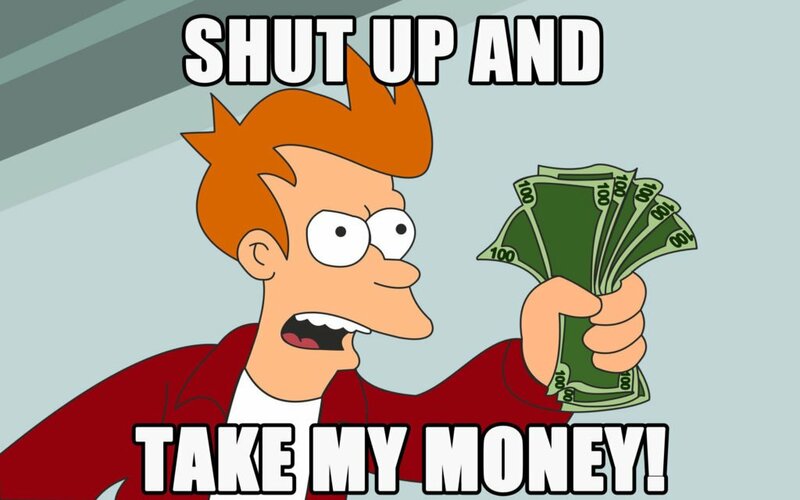 All that is to say that the 10/22 is basically begging for you to put a scope on it. It’s an excellent precision rifle, so give it a scope to go with that. First up on our list is the Simmons Truplex .22 Mag riflescope. It’s one of the most popular consumer riflescopes currently on the market and is especially popular among hunters. And it’s made specifically for use with a .22 rifle like the Ruger 10/22. At only around $50, it’s an affordable option, but Simmons didn’t cut corners with quality and durability. For starters, the main tube of the scope is constructed from a single piece to make the scope lighter, stronger, and more durable. It’s also waterproof, fog proof, and shockproof. Scope lenses are made of high-quality optical glass and have a HydroShield coating. This provides you with a sharp, high contrast picture no matter what the weather is like. Eye relief is a nice 3.75” with the 3–9×32 version and 4” of eye relief with the 4×32 version. Simmons has a proprietary version of a duplex reticle called the Truplex, but really it’s effectively the same thing and works well! The Truplex .22 Mag scope features Simmons’s TrueZero windage and elevation adjustment system for more crisp clicks and precise adjustments that make it easier to zero your rifle and prevent the scope from losing zero, even after a thousand rounds. Also handy are the SureGrip rubber surfaces on the eyepiece diopter adjustments, windage, and elevation caps, side parallax adjustment knobs, and power change rings to make adjustments even easier, even in cold or wet weather or when you’re wearing heavy gloves. Finally, it comes with rimfire ⅜” dovetail mounting rings. Another solid option for Ruger 10/22 shooters on a budget is the Tasco Rimfire Series .22 Riflescope. If you’re a serious hunter or target shooter, you may want to just skip to the next scope on this list, but for plinking or hunting within the about 50-yard mark, such as varmint and small game hunting, this riflescope with definitely do the job. It’s also great for shooters that are trying out scopes for the first time since it’s very easy to use. The included scope rings make the scope a breeze to mount to your 10/22. The adjustment knobs on the top and side of the scope make it easy to sight in and zero the Tasco Rimfire Series .22 Riflescope. The lenses offer a clear picture and are magenta multi-coated to protect the lens from scratches as well as to reduce glare and reflection. However, in low lighting or beyond about 100 yards, you may not get a great picture. The parallax isn’t adjustable but is set at 50 yards which is plenty long enough for plinking and small game hunting. Tasco Rimfire Series .22 Riflescope is well-constructed, made from a 14” long, one-inch diameter monotube. It’s also lightweight enough that it should be barely noticeable as you maneuver your 10/22 rifle. However, Tasco offers a lifetime warranty should something happen to your scope. Even if you haven’t been into guns for very long, you probably recognize the name, Nikon. Nikon may be best known for their cameras and camera lenses, but they’re actually a huge brand that makes pretty much anything that has a lense, including cameras, binoculars, microscopes, and, yes, rifle scopes. But don’t think that just because Nikon is present in a wide variety of industries means that they make sub-par products. The Nikon PROSTAFF RIMFIRE II BDC 150 is just one example of that. It’s an excellent, high-quality riflescope and it’s made specifically for use with rimfire rifles like the Ruger 10/22. The PROSTAFF RIMFIRE II is particularly well-suited for shooting longer distances. 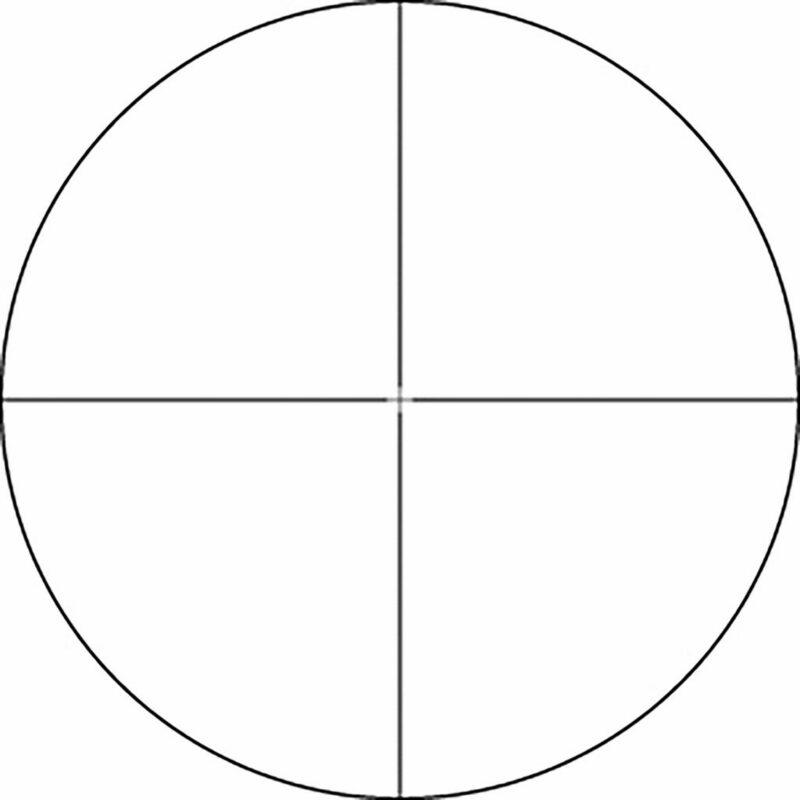 The scope’s BDC reticle with see-through ballistic circles allows shooters to account for bullet drop up to 150 yards (hence “BDC 150”), but also allows for a clear picture when you need to make short-range shots. In addition, every glass surface of the scope is coated with multiple anti-reflective layers to ensure bright, high definition pictures. And to give yourself even more of an edge, use the PROSTAFF RIMFIRE II alongside the Nikon Spot On Ballistic Match Technology program to find your reticle’s aiming points for any range, accounting for both atmospheric conditions and your ammunition. Another handy feature is the spring-loaded instant zero-reset turrets for both elevation and windage that make field adjustments way easier. Simply sight-in, lift the adjustment turret and rotate it “zero”, and release the turret to re-engage. Now you can just dial-in your ranges. The PROSTAFF RIMFIRE II is waterproof, fog proof, and shockproof, but if something does happen to it, Nikon offers a lifetime repair or replacement warranty. All of these great features come at a much higher price point than the other two scopes we’ve talked about so far, but if you have the cash to spend, it’s definitely worth it. One thing to note: this scope doesn’t come with scope rings, so you’ll have to pick some up before you can use it with your Ruger 10/22. The Nikon PROSTAFF RIMFIRE II BDC 150 comes in 3-9×40 and 4-12×40 versions. What’s your take on the Nikon? For a slightly more affordable option that’s also not short on features, consider the Vortex Optics Crossfire II 2-7x 32 Rimfire Riflescope. It’s constructed from a single piece of hard anodized aircraft-grade aluminum which is nitrogen purged and O-ring sealed to make the scope waterproof, fog proof, and shockproof. It’s easy to handle, doesn’t add too much extra weight, and is simple to install. 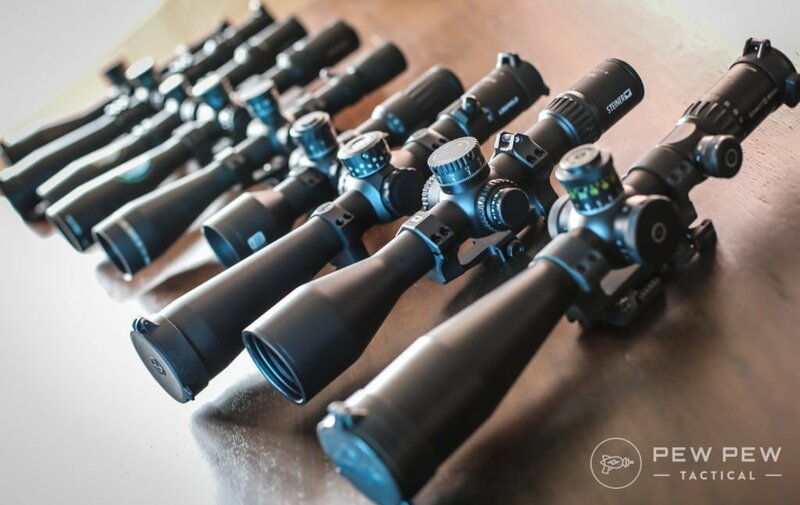 The scope is durable enough that it should have a long service life, but Vortex Optics offers an unconditional, unlimited lifetime warranty for all of their scopes. All air-to-glass surfaces are fully multi-coated to allow plenty of light to travel through them while also minimizing reflection and glare and protecting the lenses from scratches, dirt, and oil. The result is a clear, bright picture that persists even at extended ranges and in low light conditions. An integrated sunshade further eliminates glare on the objective lens. In addition, the objective lens is adjustable to prevent parallax errors. This scope has a second focal plane reticle, which means that the reticle is installed past the magnifying lens so that it stays the same size regardless of the magnification level that the shooter is using. The V-plex MOA reticle is well suited for both hunting and target shooting. The scope’s fast focus target lens makes it easy to quickly shift targets without major adjustments. Plus, the Crossfire II also has wind and elevation reset turrets similar to those of the Nikon PROSTAFF RIMFIRE II, making it easy to zero the scope and make field adjustments. Caps protect the turrets from being moved out of position while attaching or detaching the scope and during travel. The 2-7x 32 Rimfire model is particularly well-suited for the Ruger 10/22 rifle and performs well for both hunting and precision long-range shooting, but Vortex’s entire Crossfire II line is pretty great, so you may want to look at some of the other models in the line to see if there’s one that you think might be better for your particular needs. Okay, so technically a red dot sight isn’t actually a scope, but red dots are still a great option if you just want something better than the 10/22’s sights (or no sights, if you have a model of the 10/22 that doesn’t have them) for times when you don’t need a magnifying optic. 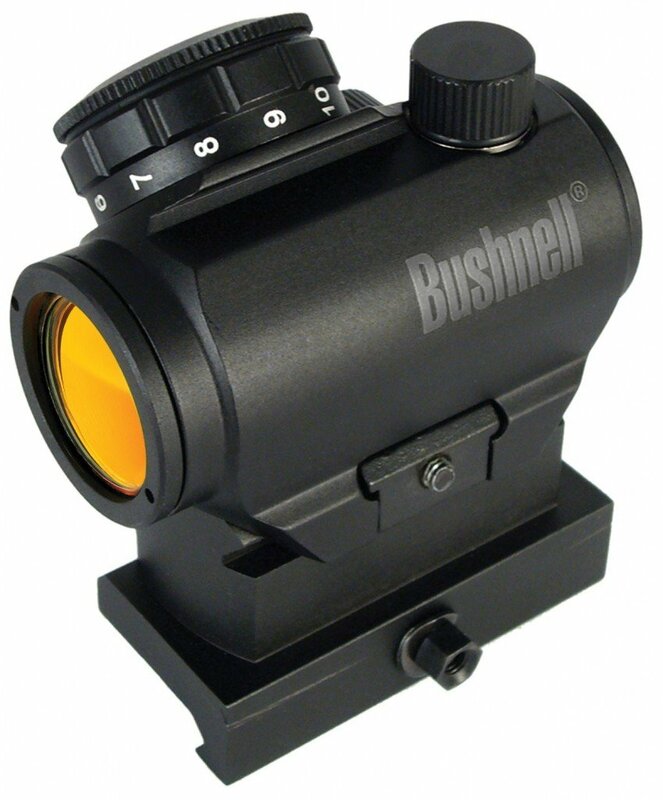 The Bushnell TRS-25 is one of my favorite red dots, especially for shooters on a tight budget. In fact, we’ve recommended it several times, including on our Best AR-15 Scopes & Optics list, our Best Red Dot Sights list, and our Best 10/22 Upgrades list, so I’m obviously not the only Pew Pew Tactical staff member that feels this way. The TRS-25 is waterproof up to 10 feet, fog proof, and shockproof. It stands up to round after round and a fair bit of knocking around (though I wouldn’t recommend testing the latter) without losing your zero. Bushnell TRS-25 Red Dot on one of our AKs! The lens is multi-coated with Bushnell’s Amber-Bright high contrast lens coating, making it easier to spot even the best-camouflaged prey, even in low light settings. This red dot sight has a 3 MOA reticle and 11 brightness settings for a wide variety of lighting conditions. At the lowest setting, the TRS-25 has an advertised 3000 hours of battery life. 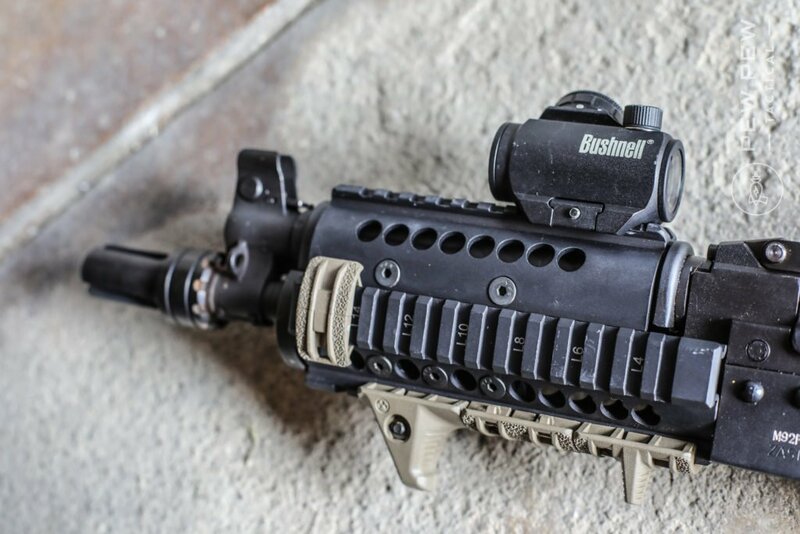 This is also a very low profile sight, certainly lower profile than a scope, and has unlimited eye relief, but some TRS-25 users have difficulty getting a solid, comfortable cheek weld. In this case, just using it with the included riser will generally fix the discomfort. Some users have also said that using the sight with a riser makes target acquisition easier. You can try it both ways and see which one you prefer. The TRS-25 is super easy to find, both online and at brick-and-mortar stores, but the price can vary wildly. Amazon usually has it for around $50. An effective optic goes a long way in improving your precision; a shooter with a mediocre gun and a high-quality scope will often be able to outperform a shooter with a high-quality gun and only a mediocre scope. In other words, treat buying any type of optics like an investment. Scopes are not the place to pinch pennies and it’s definitely worth it to take the time to make sure that you’re choosing a quality scope that’s suitable for your needs, whether they are eliminating pests in your backyard, long range target shooting, or something in between. All of the options that I’ve talked about here are excellent choices and you can’t go wrong with any of them, but they each have their own little nuances that make them best suited for different things. 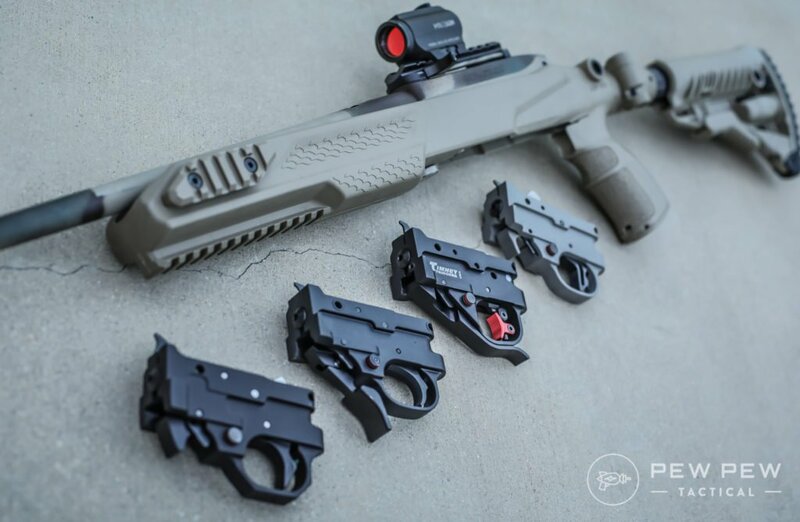 Whichever one you go with, you’ll have an exceptional optic to put on your Ruger 10/22, an exceptional rifle. Need .22lr ammo, take a look at the Best .22 Long Rifle Ammo! Or want to fully kit out your rifle? Check out Best 10/22 Upgrades. What’s missing in this lineup is a low light alternative. When I’m driving out of the woods toward the end of the day of Grouse hunting, I want a scope that can handle low light to give me last crack, on those back country logging roads, just before end of shooting time. 3-9 magnification is utterly absurd for a rimfire scope, as it is for most centerfire hunting scopes, having ridiculously narrow field of view for finding moving targets, and it’s inability to focus at close range. The size and height above the bore line is disproportionate to the compactness of a 22. Thanks to silly marketing and a gullible public, scopes have gotten far too big for any practical use beyond extreme range shooting. ProStaff is an OK scope. TRS-25 is a surprisingly decent red dot. Other optics mentioned here, forgive my bluntness, are best suited for shooting at, not shooting with. I have a PROSTAFF Rimfire II mounted on a Ruger Precision Rimfire rifle. Perfect combo to practice distance shooting- I’ve been getting consistent 1/2 inch groupings at 100 yards even with my lack of experience. Combined with the inexpensive ammo, as a poor college student I couldn’t ask for a better setup!